Free parking will be available for volunteers at One Texas Center on 505 Barton Springs Road and transportation will be provided to the volunteer site. 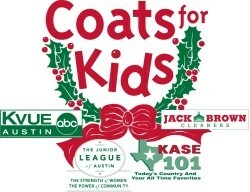 Our group will be “personal shoppers” assisting in distributing coats to the needy children of Austin. Please RSVP at the following link by Tuesday, November 24, 2009 at noon. Please keep in mind that shifts fill up very quickly, so the sooner you RSVP, the better! If you have questions about this event, please contact LT Robinson at LT@austin.utexas.edu or at (512) 232-5611. Thanks in advance for considering volunteering for this important and worthwhile cause.